The purpose of this section is to review glass types and characteristics including color, opacity, size, finish, properties, specifications, maintenance and other pertinent information that you may need in order to make an educated decision on the choice of glass for your glass field tile installation or mural. Manufacturing methods, combined with shape, size and color, determine a tile's look and feel. Should you be using glass as a surface application, searching for a custom mural or just curious about glass, we invite you to review this section of our site. Glass was used in mosaics as early as 2500 BC, but it took until the 3rd Century BC before innovative artisans in Greece, Persia and India created the first glass tiles. In recent years glass field and accent tiles have become very popular. This trend can be attributed to relatively low cost, recent technological breakthroughs that have resulted in a wide variety of choices available, as well as the inherent properties of glass to impart intense color, reflect light and imperviousness to water. If you are interested in further information on the history of glass tile and mosaics it may be found on Wikipedia. 1. Machine made: Venetian glass tile, or 'field' tile, consists of pieces of glass formed into consistent shapes. This type of glass is typically called 'Venetian'. This term originated in Murano, Italy. Originally, Venetian glass was world-renowned for being colorful, elaborate, and skilfully made. The term now also applies to machine made glass tile. Instead of the old method of rolling the colored glass mixture out, cooling and cutting, the new method called for molten liquid to be poured and cooled in trays, resulting in various sized pieces. Glass tiles are now formed using fused and poured cast methods. 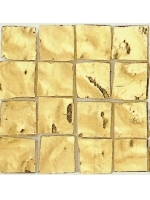 Venetian glass tile is fairly uniform in size, thickness and color. However, each batch varies slightly from the one before. Glass tile sizes are 10mm - 3/8 inch, 20mm - 3/4 inch, 50mm - 2 inch and various geometrical shapes and rectangles. Venetian glass may be transparent or opaque. The finish may be gloss, semi-gloss or matte. Edges may be smooth or irregular. The least expensive solid colored Venetian glass tile may be one solid color or one color with specks within. Other types are: Metallic Venetian which is characterized by metallic veining within the glass or metallic dust (the veining or dust are randomly located throughout the glass tile), Brushed Venetian which has non-metallic swirls of color throughout, Iridescent Venetian that reflects various colors that change as lighting angles change, Photoluminescent Venetian which emits light after dark and Gold or Silver Venetian (Gold and/or Silver leaf is added to the molten mixture. The gold leaf is typically either white gold (which looks silver when applied), 24K yellow gold, or platinum. Venetian is the most cost effective choice in glass. The range of colors is limited by the 'line' manufactured. 2. Handmade: Handmade glass is called 'Smalto'. Smalti glass tile is sometimes referred to as 'Byzantine' glass mosaic tile as it was developed for use in creating murals during the time of the Byzantine Empire.This type of glass mosaic is irregular in size and thickness and is always paper face taped. Smalti is made by using molten glass that is rolled out onto a substrate, cooled and then cut by hand into individual irregular mosaics. It is opaque as it is made by mixing molten glass with metal oxides for color, which results in a cloudy mixture. In Gold or Silver Byzantine glass a gold and/or silver leaf is added to the molten glass.The gold leaf is either white gold (which looks silver when applied), 24K yellow gold, or platinum. There is no limit to the color range in byzantine glass. 3. Pebbles or Cobblestones: Pebbles are molten glass of irregular in size and thickness. This type of glass reminds one of rocks. Pebble glass size varies per mosaic. Pebbles are created by pouring molten glass into a mold (casting). 4. Other: Millefiori, Dichroic, Tumbled Beach Glass, Stained glass, Glass Beads and/or Glass Gems and Bubbles (flat marbles) and other glass shapes are often used in combination with a background glass field tile in Venetian and/or Smalto glass are used to give an installation 'flair'. In mural work these other optional glass choices are also used, if requested. Millefiori is a glasswork technique which produces distinctive decorative patterns on glassware.The term millefiori is a combination of the Italian words 'mille' (thousand) and 'fiori' (flowers). Dichroic glass is glass containing multiple micro-layers of metal oxides which give the glass dichroic optical properties. Dichroic glass was originally developed by NASA and its contractors for use in satellite optics and spacesuit visors. The original meaning of dichroic, from the Greek word 'dikhroos' (two-colored), refers to any optical device which can split a beam of light into two beams with differing wavelengths. FYI: Metal shapes, semi precious gemstone cabochons and even seashell or ceramic tile are often used in combination with a background glass field tile You may view all of these glass types by clicking on 'View Images'. Venetian glass reflectivity and color ranges from pale to intense and is governed by the finish, which may be gloss, semi-gloss or matte. Colors may be pale to intense. Smalto glass is characterized by pale to intense color and light reflectivity. Glass is more rigid than ceramic or porcelain tile, which means that glass tiles will break more readily under the duress of substrate shifts. Glass is UV Proof, which means that it will not fade. Glass is Frost Proof and is not affected by sudden temperature variations. It is Non-flammable and Vitreous, or waterproof. Glass is resistant to chemicals and crazing. Glass is not slip resistant. Slip resistance is created by the number of grout joints. The smaller the mosaic or tile, the higher the slip resistance. Glass is easy to clean. The MOH hardness of glass ranges from 5 to 6. Glass is easy to install and may be applied to almost any surface. The durable finish requires minimal maintenance. Glass is environmentally friendly as it is made from natural materials. It becomes an integral component of the installation as well as a sustainable architecture. It contains no harmful chemicals and emits no VOC's in either its production or when installed. Glass is inert and does not react with the environment. Opaque glass allows no light to pass through. Translucent glass allows some light to pass through and transparent allows a great amount of light to pass through. Glass my be perfectly smooth or have a striated finish which is created by the substrate onto which the glass is poured. Each batch varies slightly from the one before. Variations in shade, color and size within each sheet of glass should be expected. It is important to order enough glass for your installation plus at least a 10% overage. Glass mosaic tiles may be backed with a polymer mesh, paper face taped or covered with a removable plastic film. Mesh remains permanent. The paper or plastic film is removed by the application of water. Glass tiles and mosaics are used for floor and wall cladding (both interior and exterior) and are suitable for both residential and commercial installations. Some applicable installation uses for glass tiles and murals are kitchen flooring and backsplashes, swimming pools and spa murals, waterlines and cladding, building facades, hotel and motel lobbies, carpets, medallions, borders, countertops, columns (curved surfaces), spas, fountains, water features, bathroom floors, vanity tops, tub surrounds and showers. Glass tiles and mosaics may be cleaned with any household non-abrasive cleaner using a soft sponge or cloth. Grout cleaner is readily available at your local hardware store. All of the glass covered above is used to create murals. Please see the TECHNIQUES section of this site for a complete overview.